There are topics in BJJ that repeats themselves on online forums. One of them is sport vs self defense. It seems that they are 2 gangs in Jiu-Jitsu: the sport gang and the self-defense gang. As any good stories, rivalry is compulsary for the existence of gang. After all if you do not have a rival for your gang, there is no need for the existence of your gang. Since, no one seems to get along in the BJJ community: teams vs teams, art vs art, gi vs nogi, club vs gyms, loyalty vs traitors (creonte) etc. Opps, such a great sport. Pretty much in the middle I must say. I could not care less about sport BJJ. Yeah, it is great to be able to use your skills in a competitive environment. But the rules and point system are complicated, the competitions are expensive and too long. Not many students actually competes to make it worth it. It seems maybe 10-20 % of students would compete and even if it the case, it just simply does not pay for the bills. So what do you do as an instructor? Just concentrate on the minority of your students needs and ignore the needs and interest of the majority of your paying customers. Sport BJJ is just no longer realistic. They do not even train for takedown in most gyms, they just pull train guard! While on the other hand, we have the self defense gang. They no longer really interested in sport competition. They teach takedowns, striking , they spar with gloves, teach the ibjjf illegal techniques. 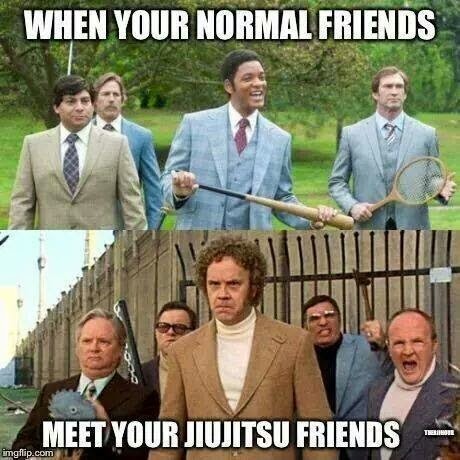 I would say that most people join bjj to learn how to defend themselves on the streets and no one really enters a bjj gym in hope to become a bjj champion. If you watch some old instructional video of Renzo Gracie and Kukuk, he teaches BJJ and explains how to use it against strikes. When was the last time you watch a video of BJJ with the same style and topic? Never! Everything is about scoring points etc..
Are we making a comeback to self-defense? Is there no market for dvd for self-defense? Is it just me or only sport bjj guys are suckers for buying every sport bjj dvd or seminars? However, Some of them are guilty of just happily clipping the ticket. They just cash in and train people because BJJ is now a popular sport created on the back of others fighting to prove its worthiness. It seems that you are now forced into choosing side. Just kidding, just find a club that offers what you are interested into. Or just find a smart instructor that caters for both. Oh well, let's not get along because as usual martial arts should make you a better person. Oops, sport should make you a better person.